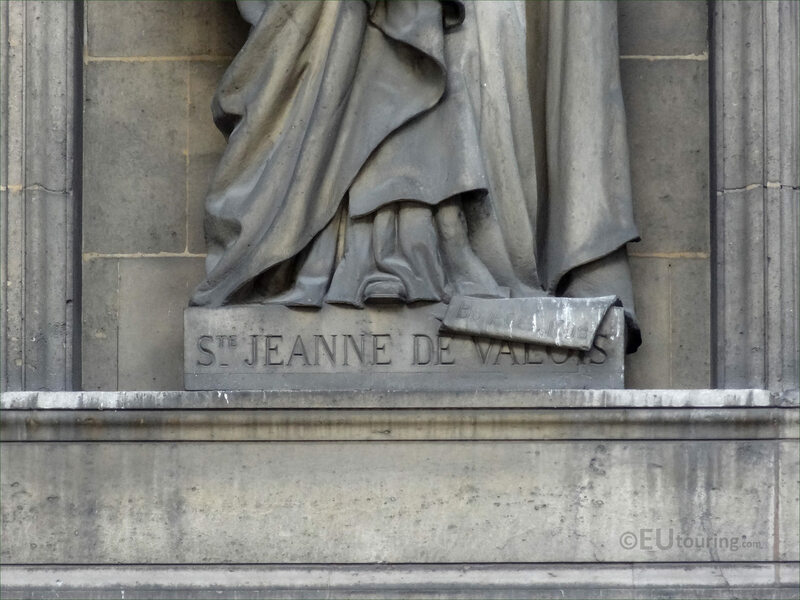 We were again at the Eglise de la Madeleine in the 8th Arrondissement of Paris when we took these high definition photos showing a statue of Saint Jeanne de Valois, which was sculpted by Arthur Guillot. 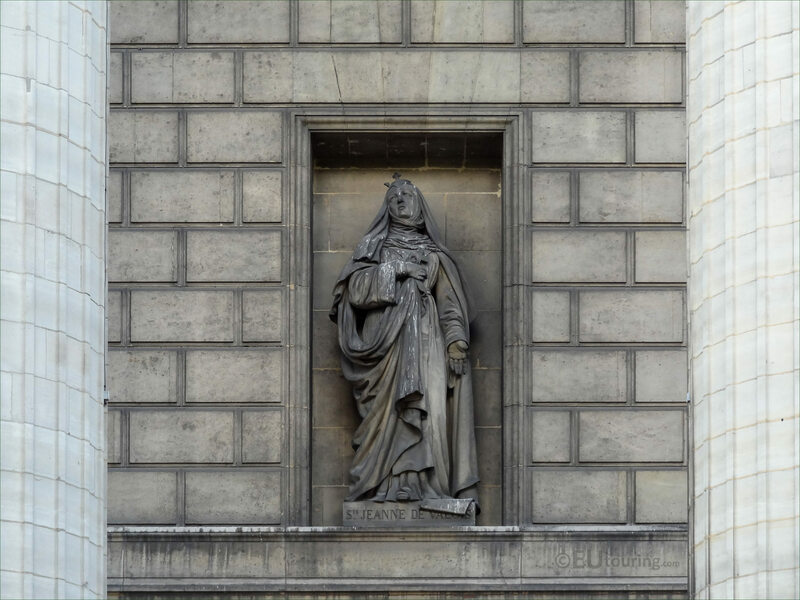 This first HD photo shows a statue depicting Saint Jeanne de Valois that was made of stone back in 1841 and this is located within a niche on the portico of the Madeleine church, which can be seen on the western facade as you are looking at the church from the Place de la Madeleine. Yet here you can see a close up showing the detailing of the statue, which was produced by Arthur Guillot who was born in Lyon and studying to become a French sculptor, he first started to present works at the 1831 Salon, however, not much is known about this particular artist and even his years of birth and death vary depending upon what sources you read. Now Saint Jeanne de Valois is also referred to as Joan of Valois, Joan of France or the Duchess of Berry due to the fact that she was once married to King Louis XII and was briefly queen, yet she is most remembered for starting a religious order dedicated to the Immaculate Conception of Mary, which is still in existence today. 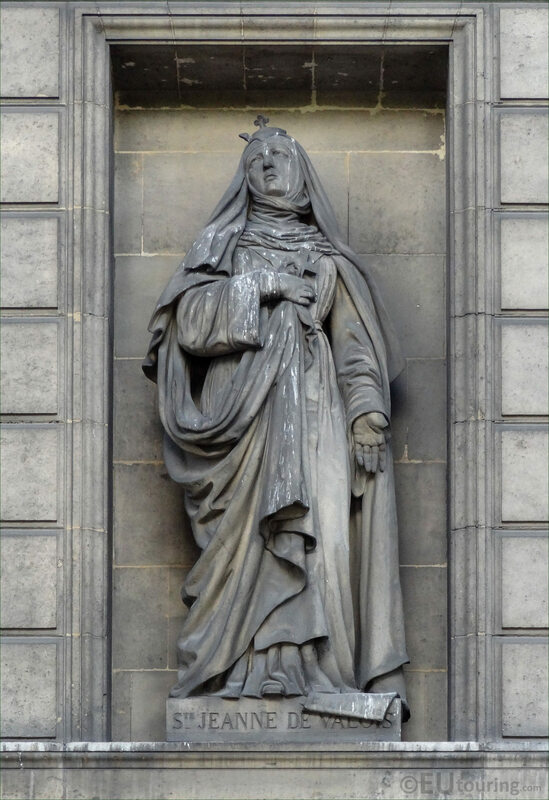 Saint Joan of Valois as she is known in the Roman Catholic church was beatified by Pope Benedict XIV in the April of 1742, however she was not canonised until the 1950s, and throughout time, like with this statue, she is normally depicted holding a cross in a nuns outfit.